Factories have grown smarter over the years with tech-driven facilities automation and process optimization. And today, the concept of smart factories has taken on a new meaning with the adoption of artificial intelligence and big data analytics technologies. Embracing this development, Samsung SDS has set out to be a leader in “intelligent factory” management solutions, which uses AI, the internet of things technology and data analytics to manage factories more efficiently and cut down operational costs. Today, the core competitiveness of a manufacturing company hinges on an optimized production process that reduces costs while maximizing efficiency and quality. And the key to obtaining this production prowess is the adoption of a well-built intelligent factory system, said Samsung SDS CEO Hong Won-pyo. 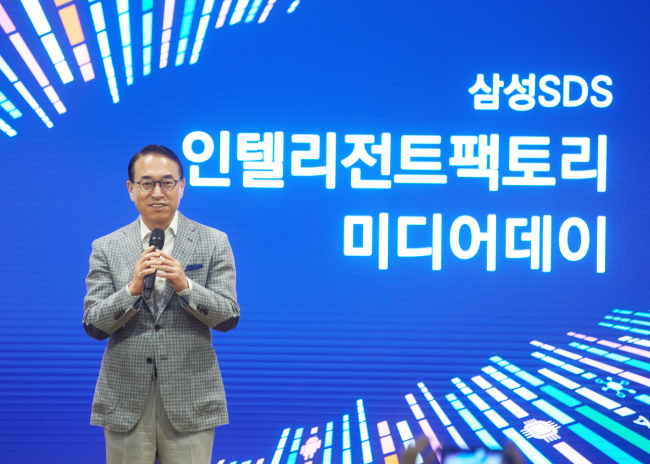 “Global manufacturing-based companies are currently competing to integrate the tens of terabytes of data generated daily at a manufacturing site, and use AI analytics tech to maximize a site’s production efficiency,” Hong said in a press conference in Seoul to showcase Samsung SDS’ intelligent factory solution Nexplant. Currently, Nexplant is applied to four core processes -- facilities, production, inspection and components delivery -- Samsung SDS said, citing the solution’s performance in semiconductors manufacturing. In facilities management, Samsung SDS uses IoT technology and AI to monitor and analyze more than 25 gigabytes of data generated by each piece of equipment. The solution can detect signs of an equipment malfunction early on, ensuring production remains unstopped. Similarly, AI analytics are used to maintain the optimal production process in real time to decrease the possibility of defective products, leading to a 30 percent improvement in quality, Samsung SDS said. From the inspections side, deep learning software that has studied images of defective components can detect such defects better than human inspectors. And as a result, defect detection accuracy has improved by 32 percent, Samsung SDS said. The company also uses sensors on the components delivery devices -- overhead hoist transport devices -- that are moving around the factory at all times to collect real-time data about their status, movement and defects. Looking ahead, Samsung SDS plans to expand its clientele to include not only Samsung subsidiaries, but also other companies with manufacturing optimization needs. It wants to expand the scope of its intelligent factory platform so that it can be applied to the entire plant, not only specific manufacturing procedures, to reap greater efficiencies. Samsung SDS’ intelligent factory management solution currently serves around 300 clients, including Samsung Group units such as Samsung Electronics and Samsung Display, as well as car components maker Hyundai Mobis, steelmaker Posco and cosmetics maker Amorepacific.